On May 12, Pulitzer Prize-winning journalist Sonia Nazario will join Facing History in Berkeley, California for a Community Conversation—one in a series of public talks held across the country in partnership with The Allstate Foundation. You can RSVP here today. Ahead of the talk, we sat down with the author of the bestseller Enrique's Journey to discuss immigration, reporting during times of conflict, and the power young people have to shape our world for the better. Facing History and Ourselves: How did you learn about Enrique and other children who are making dangerous journeys every day in order to reunite with their families in the United States? Sonia Nazario: Enrique's Journey began with a story I heard in my kitchen. I asked my housecleaner, Carmen, if she wanted to have more children. Carmen, normally chatty, began sobbing. She told me she had left four children behind with her mom in Guatemala in order to go north to work. That was 12 years ago. I remember standing in my kitchen, stunned, thinking, What kind of desperation would it take for a mother to walk away, go 2,000 miles, not knowing when or if she would see her children again? A year later, one of Carmen's sons came to find her on his own. He said he and thousands of other children were making perilous journeys through Mexico in search of their mothers in the U.S. I started doing research, traveling to Honduras and up the migrant routes through Mexico, and discovered a small army of children heading north to the U.S. unlawfully. At the time, 48,000 children made the trek each year. In the past three years, that number has risen tenfold. I wanted to find someone to speak to that was typical of teenagers making this journey. A nun at a church in Nuevo Laredo put Enrique on the telephone with me. I liked him because he was honest, open, and had been through many of the typical, difficult experiences these children face. Historically, U.S. immigration policy has often been influenced by racial and cultural stereotypes. Enrique's journey helps break down some of the stereotypes that are prevalent in our culture. How do you think Enrique's story helps people see beyond stereotypes and judgments? I believe that if I can put you in someone else’s shoes, help you understand their life and circumstances, it creates understanding and empathy. Empathy is what changes perspectives. That doesn't mean you agree with all the choices someone has made, but you can begin to understand what, in their past and present, brought them there, and how you might make similar choices. I ask questions of people that help me better understand certain issues, and their answers and stories in turn help my readers better understand and invest in the characters I portray. 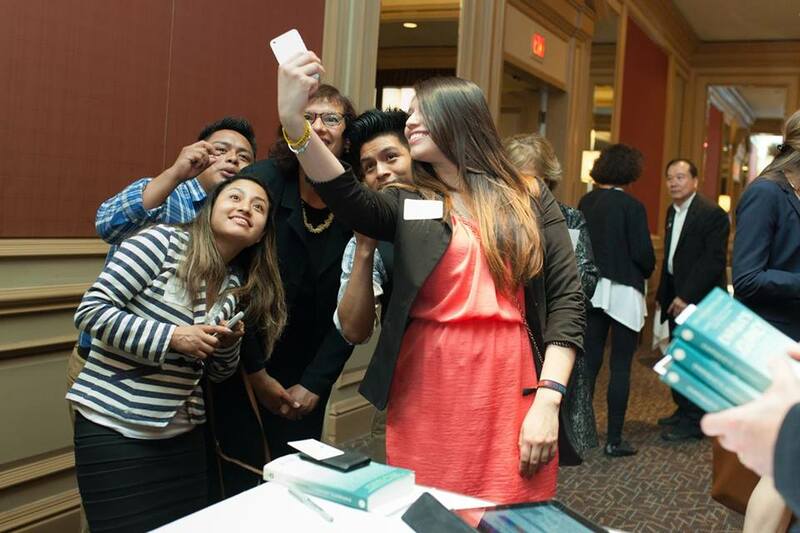 Students taking selfies with Sonia during a recent stop on her speaking tour. With Enrique's story, I felt it was important to show what is pushing people out of their countries and what children are willing to do to make this journey to America, especially during this time of the greatest hostility toward immigrants since the Great Depression. Enrique is deeply flawed, and I think that fact helps those opposed to immigration accept his story as truth. But also I think people connect with the story because of the way in which it is told—in the first person. I always hope to educate people about the biggest issues of our time in a compelling, engaging way. I want to grab them by the throat and take them on a ride, take them inside a world they might not otherwise see, and educate them about that world. This kind of immersive, non-fiction storytelling not only engages readers, but also brings about change. Stories that help us better understand our reality spur us to want to improve our world. What were some of the ethical dilemmas you faced as a writer and reporter while researching and telling Enrique's story? I lived in near constant danger of being beaten, raped, or robbed. All along the way, I encountered gangsters, bandits, and corrupt police officers. Despite everything, the hardest part was having migrants ask me, each day, for help—money or food. Since I was there as a journalist, unless a migrant I encountered was in imminent danger, I had to tell them I couldn't help. That was by far the hardest part of this journey. Reporters often witness subjects in distress when they report stories. Whether the suffering is due to a civil war, an environmental disaster, poverty, or crime, a journalist’s job is to stay on the sidelines and report what he or she sees. We are not supposed to change reality and then report on the reality we have altered; that is considered dishonest to readers. You've traveled the U.S. to tell this story, and heard from many people who have been inspired to action after reading this book. Can you share some of those stories, or do you have any tips for students or educators who want to stand up and take action? The story Enrique—of one boy—has gotten students to act and try to improve conditions. They have built schools in Mexico and Central America, water systems, homes for single mothers. A high school in California raised $9,000 selling cookies and used the money to provide a microloan to women in Guatemala so she could expand her coffee growing business and hire more workers so fewer women would have to leave for the north. In classrooms, schools, and communities young people are having conversations around an immigration solution focused on addressing the exodus at the source—a solution that would help create change in countries where violence, corruption, and bad governance are pushing people to leave. Students have confirmed my unshakable belief that with knowledge, people can change perspective and act to make things better. You can find more ways to help on my website. What changes in readers or in the world do you hope the book will continue to contribute to? I hope the book opens readers' eyes to the living history of Honduras and the evolving story of all immigrants from Central America. I hope readers become educated and involved in politics so there are more people arguing for increased U.S. financial support for Central America and better treatment of unaccompanied minors being held in immigration detention centers. I hope that readers who have anti-immigrant ideas at least become more open and tolerant of their immigrant neighbors and co-workers. Not able to attend our May 12 talk with Sonia Nazario? Check out this pre-recorded webinar featuring Sonia Nazario and Facing History Memphis Office Director Marti Tippens Murphy.